Rate this Article Finally, a device that will simulate weather conditions in VR. Let’s have a look at this latest addition to the VR gaming experience. As the use and popularity of Virtual Reality continues to expand and increase, the VR industry has been continually working on new ways to enhance and further the technology. Enhancing VR however is not just confined to movement tracking or the refinement of the optical and video technology used by the headsets, but other devices as well that advance and fit into the overall Virtual Reality scheme. An example of this would be the devices that provide both Tactile and Haptic feedback. Devices like the Glove One or the Taclim VR sandals. 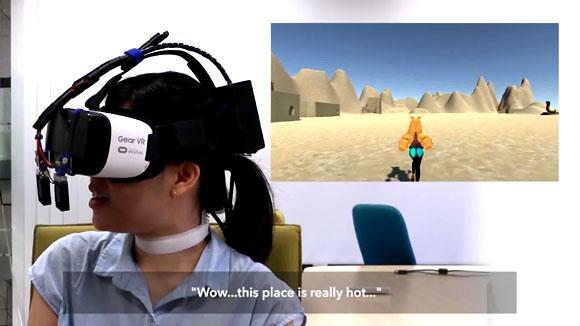 A step further would be the VR movement platforms like the KAT Walk VR harness that provides users with a wide range of flexibility in movement while staying at a single location. Smell is also one of the focal points in trying to make VR as realistic as possible and facial devices like the FeelReal VR Mask is continually being refined to deliver a safe and solid artificial scent simulator for the VR user. Researchers at the National University of Singapore led by Professor Nimesha Ranasinghe have developed a prototype VR add-on that simulates weather and temperature for the VR user. The device known as the Ambiotherm attaches to currently available VR headsets and will work in tandem with the running VR app (whether a game or simulation) to provide a near realistic experience of the weather conditions being portrayed on the headset. If the user is in an icy or cold virtual environment, the Ambiotherm will provide a cool breeze and a drop in temperature. If the wearer finds him or herself in the middle of a desert or a similar sun bleached location, the device will provide heat to match the environmental sensation. At its core, the Ambiotherm is composed of two rotating fans attached to the front of the VR headset, a sort of neck harness fitted to the back of the user’s neck and a temperature controller module that is attached to the back of the headset. The harness is attached and controlled by the temperature module that either cools or heats it depending on the simulated environment. The user then feels the changes through the back of the neck. The fans on the other hand provide a breeze or a sudden gush of air that simulates the wind (or cool air) and the rotation provides the direction where it is coming from. As of now, the device is controlled by a custom mobile app that simulates the weather conditions in VR at the same time controlling the device temperature and physically simulating it on the user. The plan would eventually be to adapt the technology to current VR hardware and apps but the Ambiotherm is still very much at the research and development stage, The potential for a fully functional finished product though would be huge as it would be able to provide the experience of the varying weather conditions that one can experience in VR. Research and development testing is currently ongoing and the results have been promising. According to Professor Ranasinghe, though the device has limited contact on the user’s body with focus only on the face and the back of the neck, test show that prolonged use of the Ambiotherm creates a sensation that is eventually felt throughout the entire body. In terms of VR gaming, the Ambiotherm would definitely be an exciting addition to the current VR devices as it would truly enhance the perception of being in the VR game world in whatever weather condition the game environment will present. For now, let’s all keep our fingers but not our eyes crossed.